The gazebo has long been a fixture of gardens as a place to enjoy the serenity of nature. 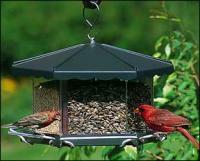 Now you can offer your backyard birds that same privilege with the Artline Gazebo Bird Feeder. The feeder features a classic look and a durable plastic construction that will withstand even the harshest weather conditions. The large feeder holds up to 10 lbs of mixed bird seed and conveniently fills from the top, so you can easily refill the feeder less often. With this feeder, you'll be able to add a little class and history to your yard. The uniquely styled bird feeder is larger and more detailed than I expected. It's actually elegant and looks great hanging on my front yard oak tree. Nice quality, good price. Amazing selection of merchandise. Really nice feeder,looks good and drains well, very happy. I received the Artline Large Gazebo feeder last month. The construction is of a quality plastic and is easy to clean. I used medium cracked corn for my first fill up and by the end of the day the birds were all over it. We had chirping sparrows, juncos, 1 sassy bluejay, and 2 cardinals so far, but not bad for a 1st day draw. The feeder is attractive to look at and simple for me to fill. That is a must for me as I had a stroke a few years ago and can only use my left hand. The price is well within the ballpark of similar feeders but I think this feeder is more attractive and detailed to look better. Drainage vents are numerous and will do a good job keeping the feed dry. I wish you made a larger feeder like this one. I would buy one...hint-hint. I also appreciate the way you answer any questions I have about feeders. I am just a little customer but your reply's have always been prompt and to the point. Again thanks for your service and kindness. Keith B. It holds a lot of feed but as nice as this is, the folks that sell these are one of the best retailers on the Web!! Mine showed up with a shattered roof and 1 call got a replacement in the mail that day ! Great store !! It is very impressive, great size, and looks like wood minus the maintenance. I received the item within a week of ordering. I would recommend it! The bird feeder was what the picture displayed and was exactly what I wanted. It arrived in a very timely manner and in great condition. I have been very pleased with this product and will order again from your company. The birds love this feeder. The larger birds had a hard time adjusting to landing and eating, but soon discovered how to accomplish this and are there all the time. I have been looking for a while for an attractive feeder. I really like this one and so do the birds; especially the cardinals. 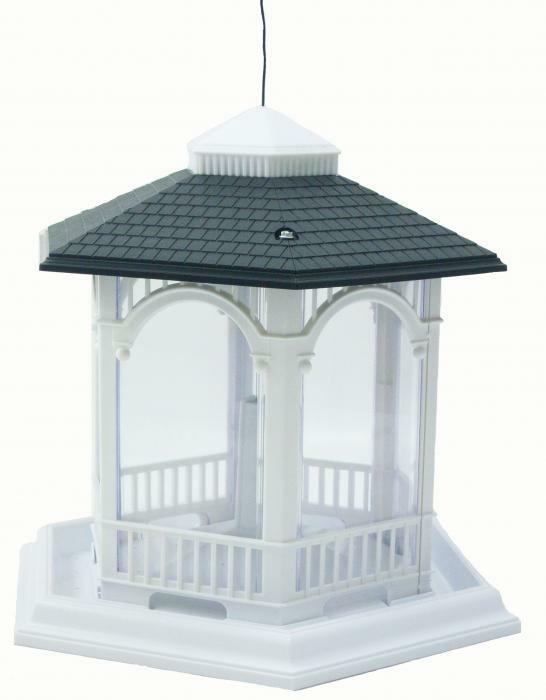 I sent this gazebo feeder to Michigan to an assisted care for My Mom. She loves it! I have not seen it but after a bad experience with another bird house from another company. I'm delighted that she is happy with it! I looked for one that was cute and functional before I found this one!!!! Yeah! Your Gazebo Bird Feeder is being used by black birds, chickadees, red winged blackbirds and other birds too. It's a very attractive gazebo. My husband enjoys watching these birds from our living room window. The last gazebo we had was demolished by a black bear. We hope this won't happen to our new one. This feeder is my most popular and they even seem to enjoy just sitting on the ledge after they have finished eating. It's great that it holds so much food because now I don't have to fill it every few days. We purchased three of these Gazebo Bird Feeders and we love them! The bigger birds, such as the Blue Jays have a harder time sitting on the edge of these to eat, but are becoming pros at it. The Cardinals stay at these Bird Feeders for a longer length of time than our old feeders, and you can really get a good look at watching them feed. We have many more types of birds with these feeders than we did with our old feeders. The really nice thing about these feeders is that they hold so much more feed than are old type, and they only have to be filled once or twice a week instead of every day. The only problem that we found with these feeders was, at first, the birds couldn't figure out how they could get through the walls to get right inside the feeder itself and feed, but it only took them a couple of days to figure out that they couldn't and it was fun watching them to try to peck through.......our old feeders were fly through. 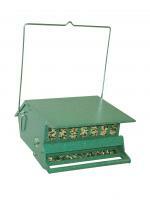 We would buy these feeders all over again, and will more than likely buy another one come spring making our total to four! We love it! It brings many hours of enjoyment to my husband and I. By the way, the birds love it too!!! This feeder holds 10 lbs of feed! I do not have to go out so often! The birds and my neighbors are really impressed! I love it! I am very pleased with this item. The birds seemed to be very happy also. 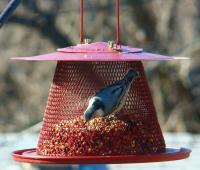 I received a lot of nice comments from my visitors about the feeder. This is an exceptionally nice bird feeder for the price. I am very happy with this purchase. This is a great price! The birds love it too! It really looks great! This is a very nice bird feeder. It holds a big bag of bird food. It is very attractive and well made. It is better than anything I have found on any other website and especially in any retail store like Walmart. I was looking for an inexpensive,decorative feeder to dress up a post located near my pool. This one is big and beautiful. It looks great and the price was unbeatable. I choose to mount mine which required making a base out of wood ,but it can be easily hung with the included wire. I am very happy with this purchase and would recommend it to others. This was purchased for my boyfriend in South Carolina. He loves it! He has cardinals, blue birds, wrens, and more that he hasn't figured out what they are. He also has humming birds. The birds in Lauren S Carolina love this feeder! A great product that stands up to the rigors of Oklahoma panhandle weather extremes. Birds love it! Was purchased from New Zealand to be delivered as a gift. This company was excellent and took care of all the details ensuring it arrived in time. I am very pleased! It is larger than I thought it would be but the birds like it. My birds will NOT go to anything that is white.I took shoes polish and dabbed it on so it now looks speckled.The birds now flock to it. It is easy to set up & looks very nice. I set mine on a pole & it works great. The birdies love it, and it is easy to care for and refill. I keep buying them and the squirrels keep opening the roof and then chewing the roof off! A round twist off cap wood help but a metal roof would be better ! Mine don't make it through a 2nd season ! This a a good feeder as it hold a lot of food. The only problem is that there are too many holes and a lot of bird food winds up on the lawn. However, I would recommend it to anyone thinking of buying a feeder. I had to place a baffle over the feeder to keep the squirrels out. A variety of birds really are enjoying it. I think that it is a wonderful size and shape. However, we would have enjoyed it more if it were make of wood and may also be more aesthetically pleasing. Hookery Poles and Sheppard pole work great for mounting.